When my very-thoughtful sister arrived for a visit, she brought along the directions and all the supplies that I’d need for a very adorable candy cane wreath. I was a bit intimidated, because the instructions came from Martha Stewart, and I’ve found that her projects and recipes are sometimes on the challenging side (with the notable exception of the adorable paper ornaments that we made last year). But this was pretty easy! 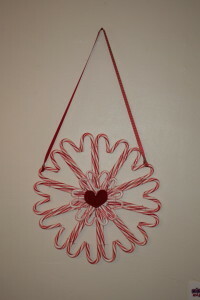 Basically, you glue a bunch of candy canes together in heart shapes and glue those together for a wreath shape. If you don’t have a glue gun, you should just buy one, man. Seriously. You can buy a little one for less than $10, and as soon as you own a glue gun, you’ll realize that they’re useful for all sorts of stuff (like Halloween costumes and general crafts), and you’ll wonder how you ever lived without one. Except that you’ll burn yourself once or twice. But it will be worth the pain. And kids love a glue gun. I know it’s scary and hot, but the good thing is that you can warn them that it’s scary and hot, and then if they actually burn themselves, there aren’t really any consequences. It just hurts for 15 or 20 seconds, and look, they’ve learned a valuable but non-life-threatening lesson. It’s not like they’re going to cut a major artery or anything. So if you can trust your kids not to do anything aggressively stupid, like spurting hot glue into their baby brother’s eye, you’re golden. There are a few modifications that I’d make to Martha’s directions. First, I’d glue the hell out of this thing. After we first hung ours up, we had a few issues with, um, structural integrity. More is more. Second, even though Martha’s creation looks very adorable everywhere, in every way, ours looked a little off-kilter in the center. Just, not all of the candy cane ends lined up in the most aesthetically pleasing way. So I covered it up with a little centerpiece. I just took a scrap of ribbon, cut it into a heart shape, and slapped it over the ugliness. Looks like I totally planned it that way. And finally, the most challenging part of this task as directed by Martha was tying little knots around each candy cane with twine. Tying them together absolutely helps with the structural integrity issue, but it’s also a pain in the neck. I think that you could skip the twine-tying and go for some lovely decorative washi tape or masking tape instead. It’s a cute little project. 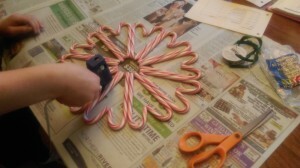 If you’re looking for more cute holiday crafts, recipes, and activities, you’ll find links here.